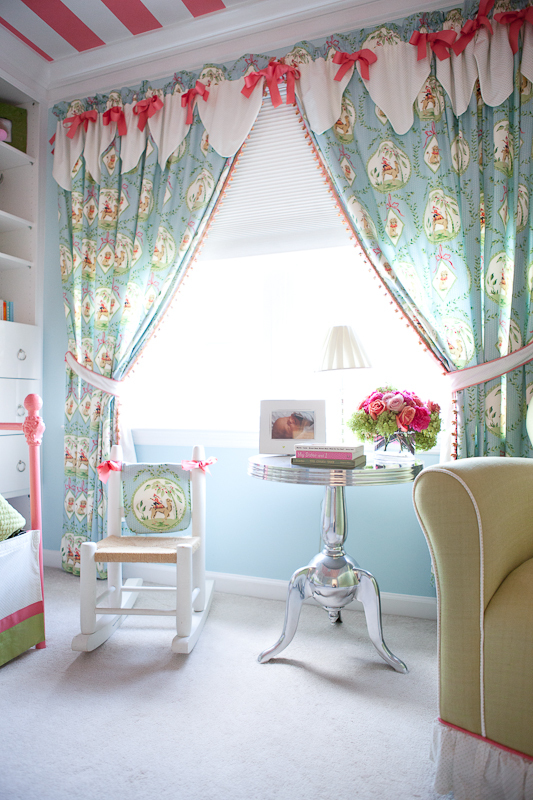 alamode: Beautiful Big Girl Room!!! Hi a' la moders! 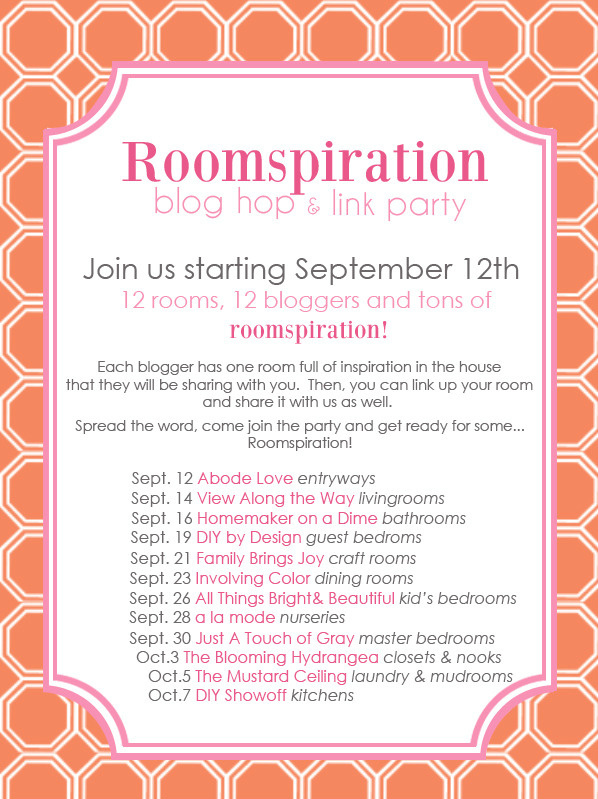 This is Krista from Kiki's List and I am so excited to share my little girl's new BIG GIRL room!!! 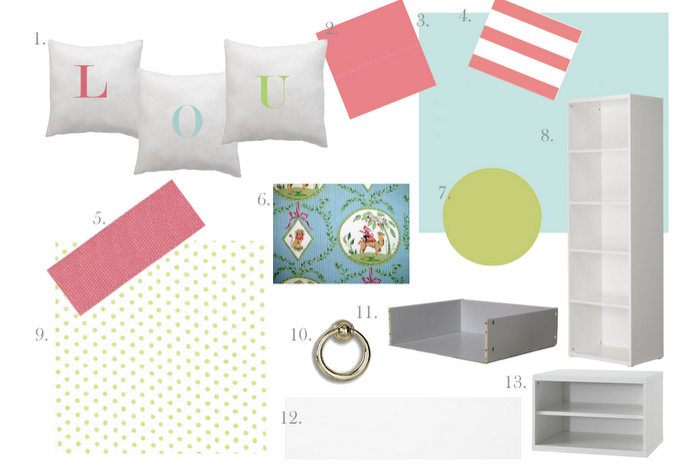 Bit by bit, we have been working on my daughter Lou's big girl room since last spring. And I am proud to finally show all of you the finished product. In between work, kids and blogging, we built the room, step by step. It all started with a plan. We were able to repurpose the bed skirt from the crib to make the bed skirt and borders for the throw pillows. The sconces were on sale at Restoration Hardware. 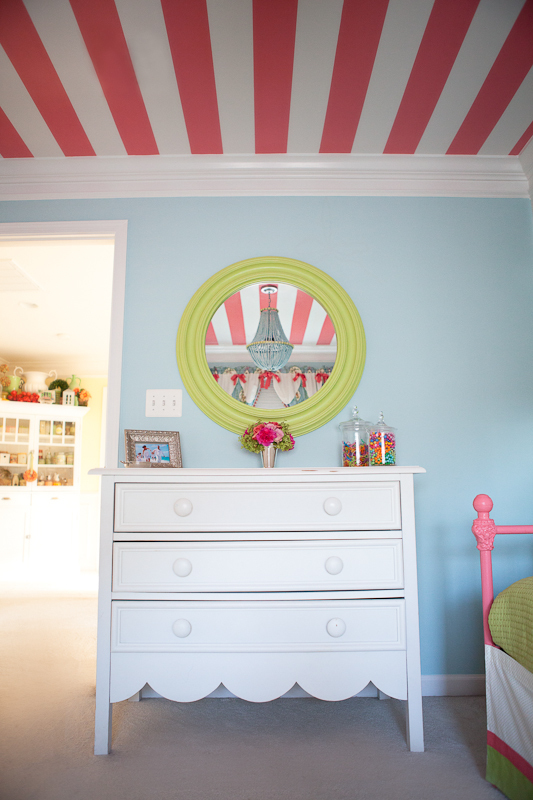 Corrine Marlowe painted the stripes on the ceiling in the same Melon Shine paint that I used on the bed. I kept the Little Castle glider from the nursery because I love it so much. The store that I bought it from (that has since gone out of business) allowed me to customize it with my own fabrics. The little chair was a gift that Mom brought back from Rhode Island when she found out I was pregnant with E.
Luckily our changing table was convertible. The mirror was a originally a butterfly picture that I scored on clearance at Home Goods. I painted it Pear Green. I knew exactly what I wanted for the chandelier... the problem is that it didn't exist. Then I found Lindsey at Simply Salvage, who worked tirelessly on this baby. Poor Lindsey had no idea what she got herself into with me. This took over 4,000 hand painted beads. She painted them Bird's Egg to match the walls. My little Lou Lou Bug simply adores her room. When it was finally done she stayed in there for hours. While in another room, I heard her talking to herself saying "This is a dream come true!!! I love my room. 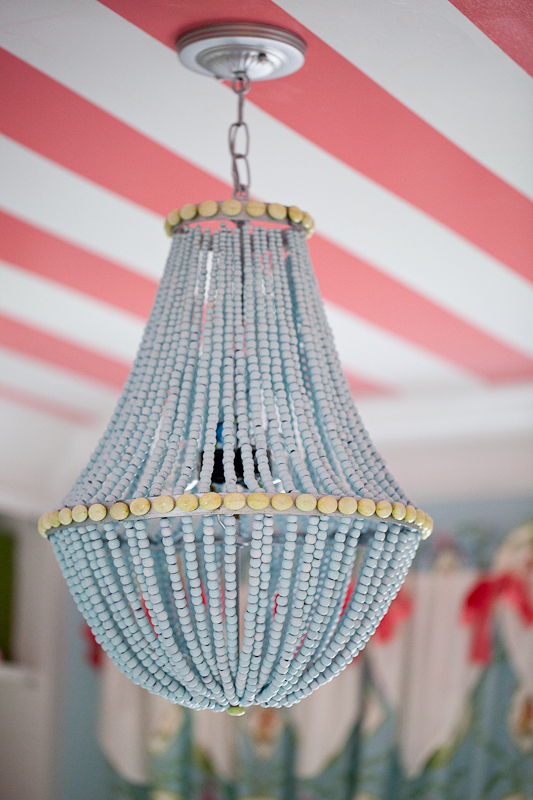 I love my chandelier... I love my pink bed... I love my special lights (that would be the sconces.).... I love my flowers.. " Yada, yada, yada. It warmed my heart. And that my friends, made it all worth it. She has slept in her room every night since. This room is amazing! I want to sleep in here! Cute, fun, and transitional... will be good for years to come! I really love it! What a fantastic room! What a beautiful room! I love that they took the bookcases to the ceiling for extra storage. Wow! This room is truly beautiful. 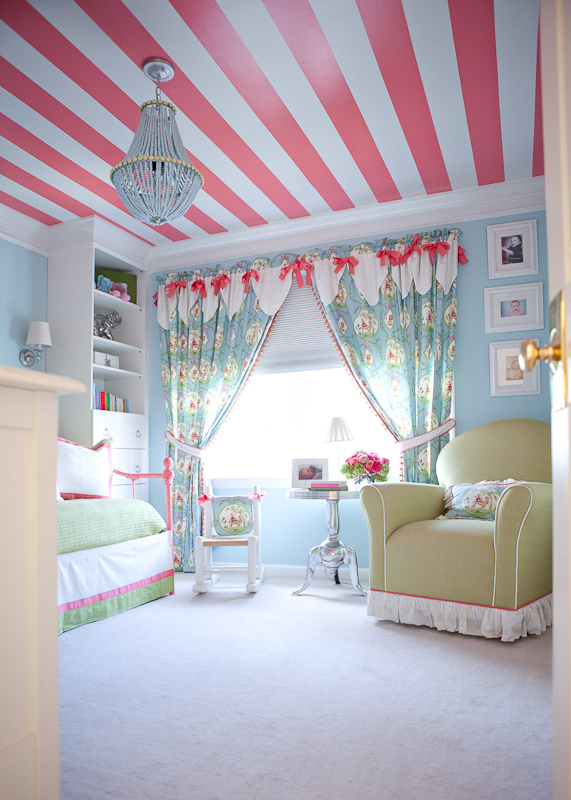 The striped ceiling is amazing and I love the custom pillows, the chandelier and the bed! So much thought and effort went into this room, for sure! Krista is very talented and has great taste! Her little girl is so lucky! I am off to check out her blog now! Thanks for the intro, Shelli! P/S: Don't forget to enter the fabulous giveaway! WOW!!! This is an absolutely ADORABLE room! Holy Moley! Just stunning! This is amazing! That ceiling is a show stopper for sure. Great job! What a great room. I am currently working on a 10 year old girls room. Unfortunately mom wants a clean streamlined look. Oh well. I can enjoy this one. That is a dream bedroom for a little big girl. It's perfect! 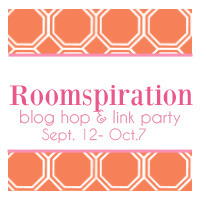 This room is ri-dic-u-lous! How perfect for a little lady! The bed and shelving kinda reminds me of that famous shot of the girl's bedroom designed by Massucco Warner Miller. I love it! This is absolutely gorgeous - I actually gasped out loud at it's loveliness when I saw it. Amazing! WOW!!! Adorable!! 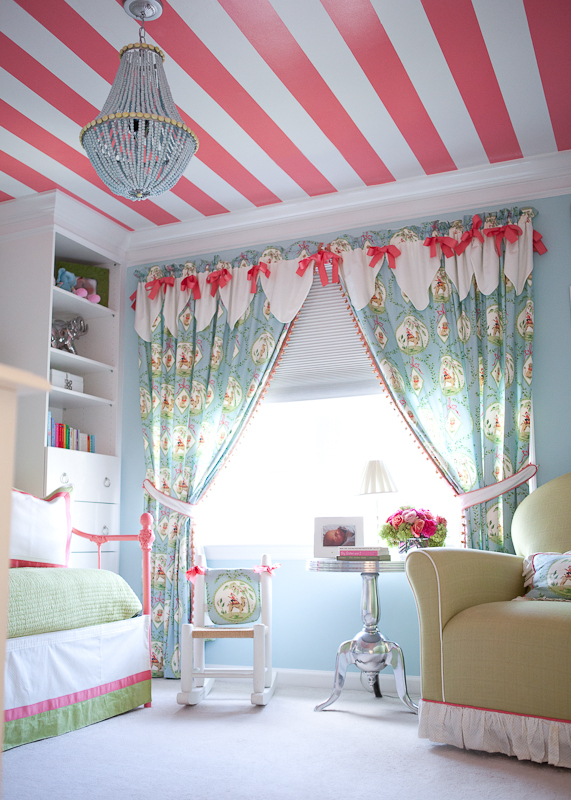 This is such a girlie girl room. The ceiling is sublime! Man! I want to live in this big girl's room... it's all so wonderful! What a beautiful room! 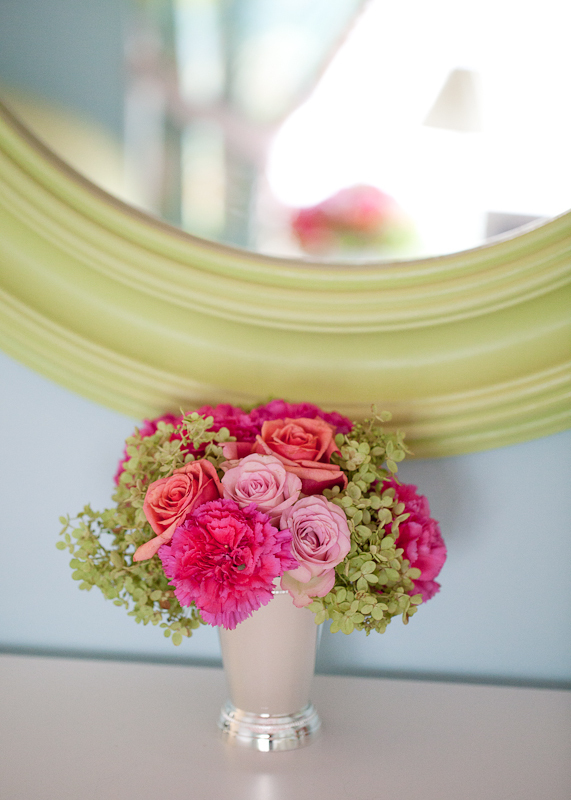 Gorgeous colors and has a touch of whimsy, which I love! 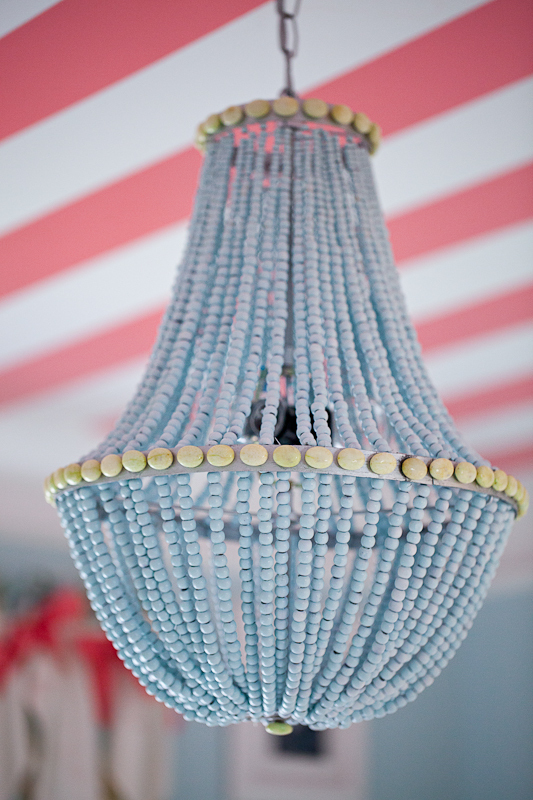 The chandelier is a work of art! The little chair is precious and what a special gift from her mom. I looked at this post a few times today and each time discovered something I missed the previous time. Every detail is amazing. A room fit for a princess! How fun! I love this room!!! It’s just beautiful! Amazing! I would love to be the big girl who lives in this room! THAT is an adorable room.....every detail! Wow! The details are all pretty fabulous. I'm loving the curtains! I love this room! LOVE! We have a daybed very similar to that one that I really want to paint for my little girl. Can you share your secret? Can you give me any tips for painting the bed?? Thank you!!! !